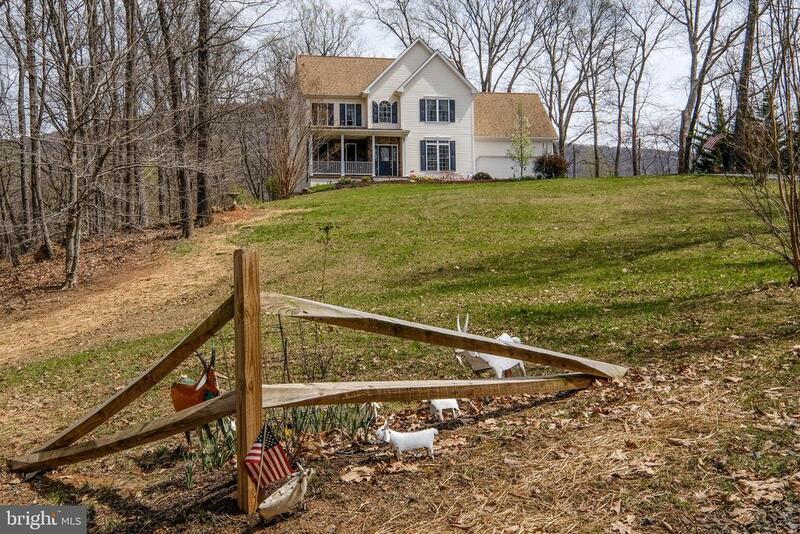 It feels as though you can reach out and touch Skyline Drive from this magnificent 5+ acre lot with an upgraded 2, 200+ finished square foot four bedroom home. It boasts over 1, 000sf that could be finished in the walk-out lower level (w/rough in for a full bathroom and a window for a future bedroom). The owners have invested more than $25k in upgrades since they built their showplace that is move-in ready (including $9, 000 in paving for driveway). Gaze at the mountains from the 18x12 screened in porch or the 12x8 covered front porch (complete with porch swing). There are 360 degrees of mountain viewing pleasure in this ideally located homestead just 5 scenic miles from town. In the winter, trees offer excellent privacy, and in the spring, Red Bud trees and flowers flourish!Features IncludeHardwood floors, ceramic tile, granite counters, 9 foot+ ceilings, walk-in closets, tray ceilings, vaulted bathroom, maple cabinetry (even in the bathrooms, with roll outs and built in trash area in kitchen), under cabinet lighting, breakfast bar (with 5-6 people seating), stone backsplash, convection oven, crown molding, two story foyer, lovely level rear yard, stone gas fireplace, screened porch, whirlpool tub, tiled shower, furnace humidifier, excess parking, alarm system (currently not active), energy star windows, fireplace fan, high speed internet (Centurylink), custom front walkway, more!This bright, like-new property has hard-to-find features like a charming reclaimed wood shed (17x17 ), a deep well with a bonus back up holding tank (sellers were moving from the city and didn~t want to ever worry about water issues to they proactively built a holding tank and just recently replaced the pump in tank and well), and an overall spacious feel from the oversized front porch to the bonus area adjacent to the 2 car garage. Act quickly, this home is sure to fly off the market!